Over the past decade, nearly half of internal medicine residencies have implemented block clinic scheduling; however, the effects on residency-related outcomes are unknown. The authors systematically reviewed the impact of block versus traditional ambulatory scheduling on residency-related outcomes, including (1) resident satisfaction, (2) resident-perceived conflict between inpatient and outpatient responsibilities, (3) ambulatory training time, (4) continuity of care, (5) patient satisfaction, and (6) patient health outcomes. The authors reviewed the following databases: Ovid MEDLINE, Ovid MEDLINE InProcess, EBSCO CINAHL, EBSCO ERIC, and the Cochrane Library from inception through March 2017 and included studies of residency programs comparing block to traditional scheduling with at least one outcome of interest. Two authors independently extracted data on setting, participants, schedule design, and the outcomes of interest. Of 8139 studies, 11 studies of fair to moderate methodologic quality were included in the final analysis. Overall, block scheduling was associated with marked improvements in resident satisfaction (n = 7 studies, effect size range − 0.3 to + 0.9), resident-perceived conflict between inpatient and outpatient responsibilities (n = 5, effect size range + 0.3 to + 2.6), and available ambulatory training time (n = 5). Larger improvements occurred in programs implementing short (1 week) ambulatory blocks. However, block scheduling may result in worse physician continuity (n = 4). Block scheduling had inconsistent effects on patient continuity (n = 4), satisfaction (n = 3), and health outcomes (n = 3). Although block scheduling improves resident satisfaction, conflict between inpatient and outpatient responsibilities, and ambulatory training time, there may be important tradeoffs with worse care continuity. We presented preliminary findings from this study at the Society of General Internal Medicine Annual Meeting in Washington, D.C., in April 2017. The online version of this article ( https://doi.org/10.1007/s11606-019-04887-x) contains supplementary material, which is available to authorized users. The authors thank Lynne Kirk, MD, FACP, for her advice, input, and helpful comments on a draft of this manuscript and Anil Makam, MD, MAS, for his input on the analytic approach. Dr. Nguyen received support from UT Southwestern KL2 Scholars Program (NIH/NCATS KL2 TR0001103). Ms. Mayo and Dr. Nguyen also received support from the AHRQ-funded UT Southwestern Center for Patient-Centered Outcomes Research (AHRQ R24 HS022418). The study sponsors had no role in study design, data analysis, drafting of the manuscript, or decision to publish these findings. Accreditation Council for Graduate Medical Education (ACGME) 2009;Pages http://www.acgme.org/Portals/0/PFAssets/ProgramRequirements/140_internal_medicine_2016.pdf. Accessed 6 Dec 2018. 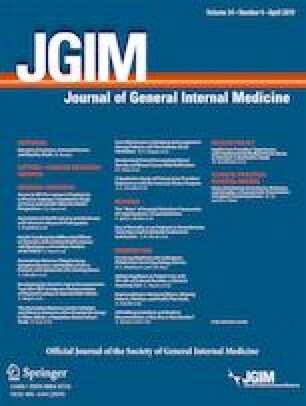 Association of Program Directors in Internal Medicine (APDIM);Pages https://www.amjmed.com/article/S0002-9343(17)30987-7/pdf. Accessed 6 Dec 2018.